Coming a few months after the poor Space Panic, Donkey Kong is the second platform game in the history of gaming. When it hits the arcades in 1981, the title is acclaimed by critics and meet a huge success with gamers. So much so that one can literally say that it was the springboard to success for Nintendo: revenues generated by arcades and console adaptations - especially the great CBS Colecovision one - fill the coffers of the company and cement its reputation. In the early eighties, almost everything in videogame remains to be invented. This world is still in its infancy, and some firms develop at this period a few titles that will become legendary: Scramble, Burger Time, Vanguard, Galaga... all are famous names which invented styles or set basics for different gaming genres. That said, Donkey Kong remains one of the most iconic videogame of all times. And for good reason! When the arcade game was released in 1981, it made sensation: the player embodies Jumpman - who will later become Mario - and must climb the floors to save Lady, the princess kidnapped by Donkey Kong. A scenario that inevitably recalls King Kong, and which was also worth a trial to Nintendo by Universal. Fortunately for the japanese, the U.S giant lost and was dismissed of all its claims. Shigeru Miyamoto was in charge of the game's development, and his talent was already undeniable: The graphics are above the competition, offering a beautiful and original design. Player have to go through floors of a building construction site, with metal beams, ladders, barrels, hoists, etc. DK is colorful and varied, with no less than four different game screens with distinct designs, each featuring an action of its own. If the main characters are well made, enemies and items are not left out: barrels, flames, springs, bowls, birds ... everything is fluidly animated, especially for the time. The movements of the hero are quick and handling is optimal, despite being extremely simple: only the four directions of the stick are used, plus a button for jump. In every stage, you can collect bonuses and mallets: like Pac-Man, it has the hero becoming invincible and able destroy his enemies for a few seconds. Donkey Kong is divided into no less than one hundred and seventeen levels, with our four fixed screens looping. The difficulty goes crescendo, of course! In fact, it's all about making twenty-two 'loops', which are counted in blue at the top right of the screen (L = 04). If the first loop has only two stages, in the following features three, and so on up to a maximum of six. The one hundred and seventeenth level is known as the 'Kill Screen': a bug in the game (intentional or not) have Jumpman invariably dying after a few seconds, ending the game. But will we get there?! Below the loop counter is a 'bonus timer': it is a credit/time counter that decreases gradually. The sooner you finish the level, the more points you collect. If it reaches zero, you die. You also die if you fall from a platform. If you touch an enemy, a fire, a barrel or even Donkey itself, you will die too. In short, prepare to multiple deaths! If the first stage is to go up the slope avoiding barrels that DK throws from the top, the second is a little different: you have to climb ladders to reach the last platform, but the enemies are not the same and the structure is different too. The third floor is more about 'platforming', and requires a significant level of accuracy and timing for the jumps... and finally, the fourth stage is about to break the seals of the structure, to get our gorilla falling from the top of the building and save the princess. The challenge is taking, the action well-crafted, scoring system well thought out and the atmosphere of the game simply legendary! Donkey Kong is still taking more than thirty years after its release, and a bunch of far more impressive titles: but once will not hurt, simplicity is sometimes an impressive asset. In 1981, Donkey Kong is one of the few titles able to offer such a level of detail and graphic variety for enemies and stages. Nothing to complain here, Jumpman moves fast and well, and enemies on screen are many and nicely animated. Here again, hardware doesn't allow all the fantasies... but Nintendo made a great soundtrack for Donkey Kong, with classic old-school effects and nice, discrete music. The game packs no less than 116 stages before the Kill Screen. Due to the very high difficulty, many players might not even pass the first stage! Despite the difficulty, controls and gameplay are nice and have you want to challenge the game. Each level requires its own strategy, and accuracy + timing are essential. 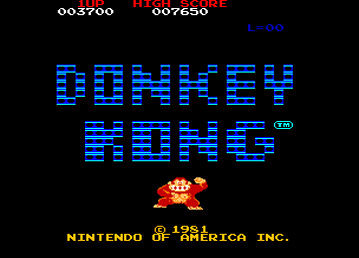 Donkey Kong is a mythical game of platform, truly revolutionary back in 1981. The next generation of platform games such as DK are Bubble Bobble and Parasol Stars, so we can go for Nightmare in the Dark, Zupapa! or Bang² Busters to find a similar gameplay.